Cleaning your hot tub will keep both you and your Hot Tub Happy. Following these few simple steps can keep your hot tub clean and trouble free. It’s not as much work as you think and it will keep your hot tub in great condition. Clean or replace your Cartridges. Clean your hot tub’s filters about once each month, A normal cartridge will last 2 to 3 seasons if properly cleaned and maintained. Rinse your cartridge off with a garden hose, filter wand or Aqau Comb attachment. Spray into the filter pleats and remove any trapped dirt and particles. 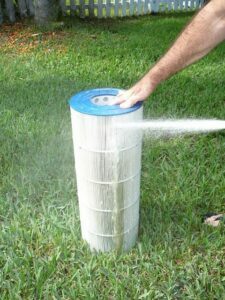 Fill a 5 gallon bucket with water and add Bear Strip Filter cleaner, (Always following label instructions). Submerge the cartridge and allow to soak for 3 to 24 hours. Remove the cartridge and rinse with Aqua Comb again to remove all excess cleaner. Allow to dry. Allowing filters to dry completely after cleaning will help destroy any resident microorganisms. You may want to buy an additional filter to keep on hand. This way, you can allow one filter to soak, while using the extra filter in your hot tub (ask about filter rotation). Inserting a dry filter each time may have the added benefit of keeping your spa’s lines clean. Filter cleaning is important because dirt and debris trapped in your hot tub’s filter can slow the flow of water and affect the performance of the spa. Filter cleaner should be used on Reemay polyester filters only. If you have ceramic or are unsure of your filter type ask you Lab Tech for help. It’s a good idea to drain and clean your hot tub or spa every three months. If you have an acrylic shell, it’s simple to clean, and you can be assured that the non-porous surface won’t allow dirt, soapy film, or germs to penetrate. 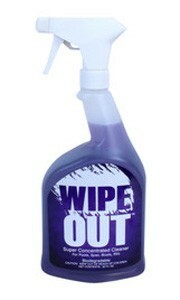 Simply use a mild cleaner like Wipe Out, and wipe the acrylic with a Ultra Mitt, damp sponge or cloth. Do Not use an abrasive cleaner or applicator, or a product that contains bleach. After Cleaning be sure to use a clean cloth and go over the shell one more time to remove any excess cleaner prior to refilling. If you want to clean the acrylic above the water line while the water is still in the hot tub, be sure to use a natural enzyme product recommended by the hot tub manufacturer. Using a kitchen or bath room cleaner can damage your spa shell or cause unforeseen water chemistry problems. Drain and clean your hot tub every three months. Be sure you are using the right kind of cleaner. You see the spa skirt every time you look at your spa. Remove your service panel to ensure not small animals or rodents have moved in. Then re-attach. Wash down the spa skirt. If needed scrub off staining or mildew. Do Not use an abrasive cleaner or applicator, or a product that contains bleach. Clean you cover. A Hot Tub cover is a major investment and with proper care you can keep you cover clean and health, even add years to its life. Spray off you hot tub cover with a garden hose. Using a cover cleaner on the outside of the cover only, clean your cover. Always follow label instructions. To clean the underside spray with a garden hose and air-dry the cover. Because your hot tub cover is exposed to the elements, We recommend clean apply protector each time you clean your spa. Remember to use the cleaner only on the top of the cover; you don’t want to interfere with your water chemistry. A guide to surviving harsh weather in style! IS YOUR HOT TUB READY FOR FALL?